I've been in love with metal garden art for awhile. There was a little shop in Pepin, Wisconsin that I ran across a few years back that had the most adorable garden art made from old springs, screws, hammers and just about anything metal. The art form seems to be gaining popularity and recently I discovered two very talented North Dakota metal artists. Their work can be seen here and here. This is my first purchase from Thomas Ironworks in Bismarck, ND. 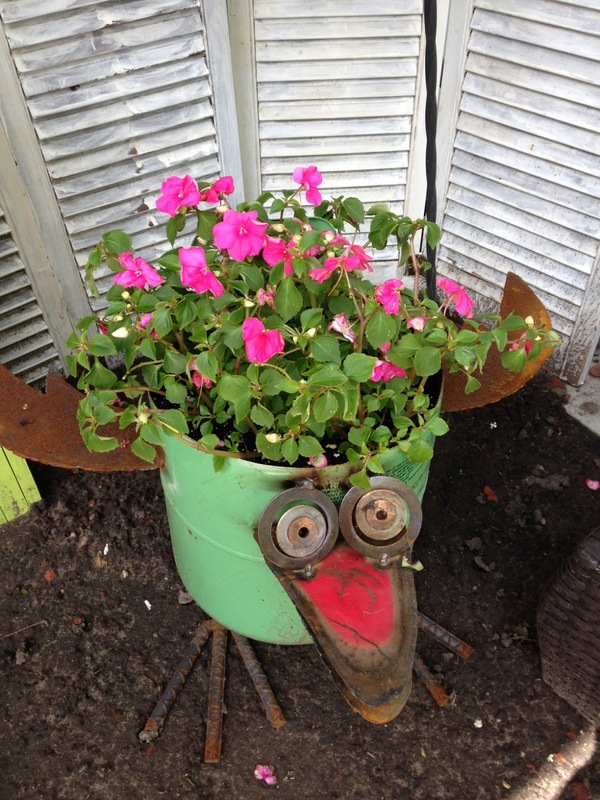 His little creatures are a true work of art, but double as adorable planters. The pop of color he provides in his pieces is a nice touch. These little whimsical creatures he creates seem to have a personality of their own! I look forward to filling my pot every year with something new! My favorite of Karman's work is her creations from kitchen gadgets and appliances. I would be more inclined to display her work indoors rather than out in my garden. But each artist has a unique style that I just love! Next on my creative bucket list...you got it, learn to weld! I can't wait to hit the farm and search for junkin' treasures! !